Be aware, that authentication is not connected to any other service (like OpenStreetMap, OpenStreetBrowser Dev, Github, Weblate), so you need a separate account there. Not all parts of OpenStreetBrowser can be translated there, e.g. date formats have their own separate repository, as you have to actually produce code (it’s just too complex). OpenStreetBrowser.org got a new feature update (4.5)! You can now filter category results by certain criteria (e.g. title, type, …). 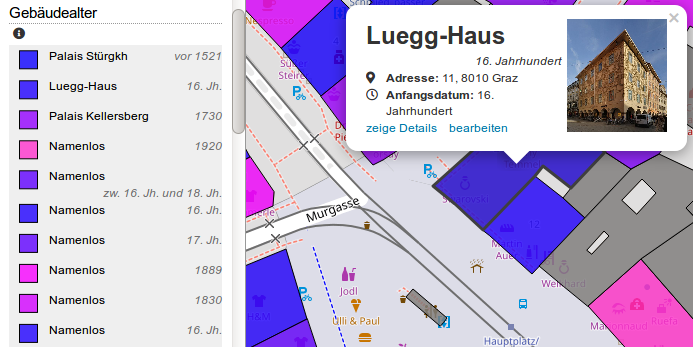 Again buildings age in Graz, Austria (haven’t found many places so well mapped). This time with German dates. Note also the image, included via Wikidata. Read more on the OpenStreetBrowser Blog. The current category update for OpenStreetBrowser has been in the making for quite some time. 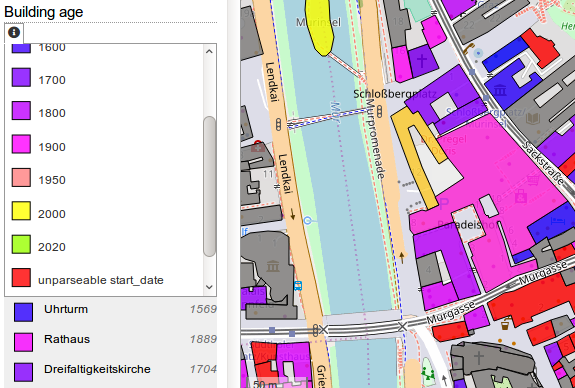 The main changes are more detailed categories about buildings (type, age, height, …), an inclusion of map features with office tags in thematic maps and more detailed popups in the Culture categories. Custom repo: It’s possible to create custom categories for some time now, now you can load an alternative repository as base categories. E.g. : The categories of user mr. satterly. In the repository selector, there’s a link “Use this repository as base repository”. Collapsed lists: The lists of map features (of a category) are now truncated, and there’s a link “Show more results” which will show you the rest. Permalink: As requested, there’s now a “Permalink” in the menu at the bottom. 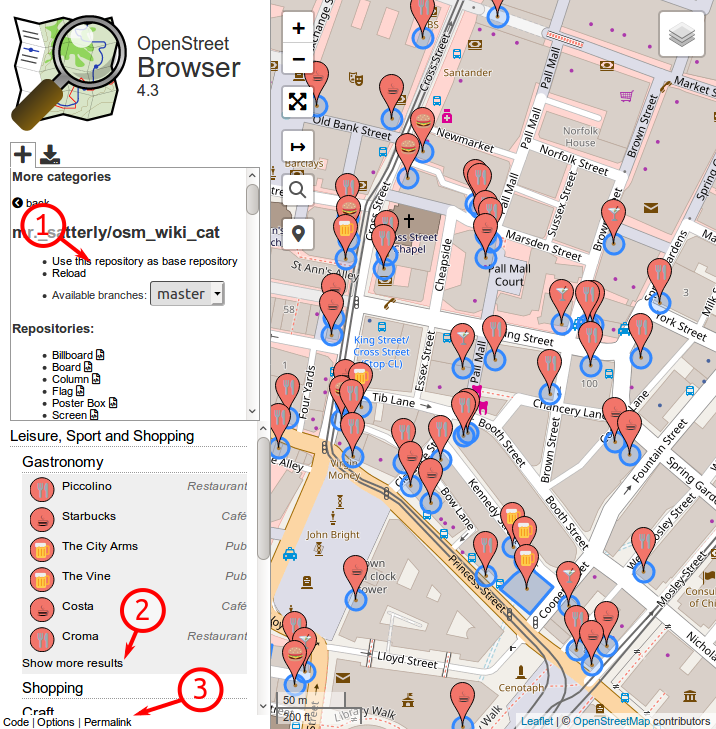 Read more about OpenStreetBrowser on the blog. 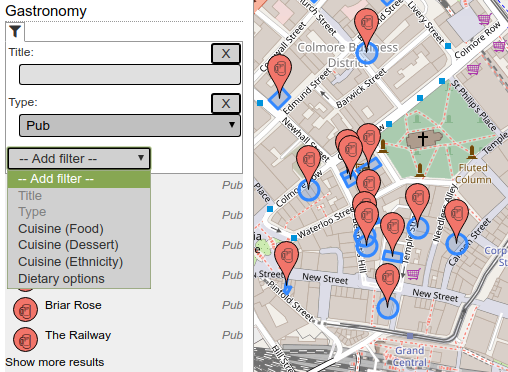 Main new feature: * Export all visible map features as GeoJSON, OSM XML or OSM JSON! Until yesterday OpenStreetBrowser completely ignored the “office” key. Now I created an “Offices” category (under “Services”), but I’m not sure about it’s usefulness. It would be great to get some input from the community on this. 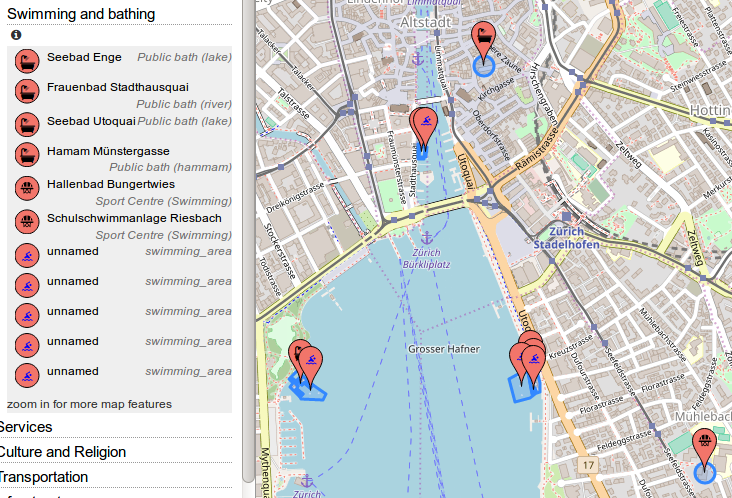 There’s a new category “Swimming and Bathing” (under “Leisure, Sport and Shopping”) in OpenStreetBrowser. If you have ideas for improvements, you can post ideas on the Github issues page. Last weekend I was on the Sziget Festival which is held every year on Óbudai Sziget (Sziget=Island) in Budapest. I mapped some of the ways there.